Generation X cymbals are proof of how cutting edge dance and hip-hop sounds have lit up the imagination of drummers in all kinds of musical genres. 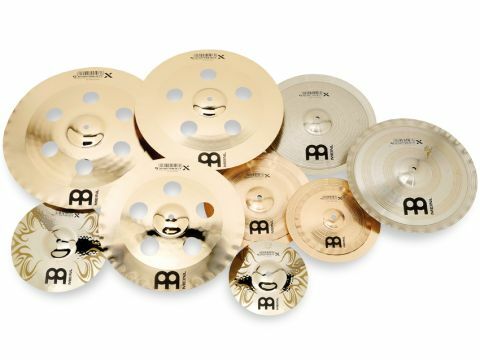 It's no surprise that some of Meinl's more adventurous endorsers - Johnny Rabb, Thomas Lang, Benny Grebb and Jason Bittner - have either been influential in the development of Generation X models or have swiftly incorporated them into their set-ups. They allow sounds previously available only through programming to be reproduced acoustically. Perfect for experimentation and breaking away from routine sounds. Plenty of unusual tones and textures to play with. Obviously, they're not going to suit every drummer. The Generation X range is a reflection of the inventive sounds and rhythms in so much contemporary music and is confirmation of just how creative and keen to experiment us drummers are. On review is a selection from the Generation X stable. The newest models, two pairs of FX hats, are the only recognisably conventional cymbals of the lot. Available in 8" and 10" diameters, the hats are made from FX9, a tinless blend of copper, zinc, manganese and aluminium. Unlathed but regularly hammered, they are buffed to a mirror finish. Each bottom cymbal has a pair of punched holes 30mm in from the edge while stencilled tribal graphics adorn the outer faces. The 8" hats are razor sharp, with little in the way of a conventional note beneath their whiplash attack. In keeping with their diminutive size they react so quickly that just shaking a stick in their general direction seems to provoke a response. "Any drummer keen to experiment or break out from routine sounds will find plenty of unusual tones and textures to play with"
The 10" hats are equally speedy and snap at the sticks like an angry Jack Russell. There is a little more in the way of body present in the larger pair, though the note is still supremely bright and glassy. Both pairs of hats have clearly been designed to suit super-fast dance/drum'n'bass players and are capable of expressing whatever runaway patterns are thrown at them. By the same token, though their shrunken diameters might suggest a lack of volume, the high frequencies they produce carry pretty well. Up next are German wunderkind Benny Greb's signature 12"/14" Trash hats. Also made from FX9, they pair a normal 12" top cymbal with a 14" china below. Benny intended them to be used as auxiliary hats, but they can be mounted on a regular cymbal stand. First impressions are of a high-pitched and metallic-sounding pair of hats; trashy, but in a clean way, without any darkness or exotic overtones. Closed tight and played with stick tips they are dry and crunchy. Once opened up a little they soon froth with a trashy wash. When hit with the shoulder of the stick the sound is reminiscent of a tinny snare sample. The 12"/14" X-treme stack bears some visual similarities to the Trash hats, combining a regularly-shaped 12" top cymbal with a 14" china beneath. iveted to the china are four pairs of jingles. Designed to be mounted on a cymbal stand, the X-treme stack's sound is fuller than that of the Trash hats. The attached jingles emphasise each stroke, creating an additional accent. Loosening the cymbal stand nut encourages the two cymbals to participate in what sounds like a sizzling quarrel, while the jingles keep the attack focused. Electro stacks are based around the same principle of sandwiching two differently sized cymbals together. Made from B8 bronze, the larger bottom cymbal has a normal bell, but the bow of the cymbal rakes upwards, with the edge being only fractionally lower than the centre hole. Above it, the top cymbal is conventionally-shaped except for the crinkle-hammered edge. The richer alloy is immediately apparent upon playing, as both pairs (8"/10" and 10"/12") possess a degree of warmth and finesse not found in the FX9 models. They're still trashy, but more like aggressive splashes that come to life instantly before quickly choking back to nothing. Representing larger diameters - in the form of 15", 17" and 19" - is a trio of China crashes. Looking not unlike bronze flying saucers, they are clear hybrids of the two models outlined in their name. Thin enough to flex easily in the hand, they are made of B10 bronze and sport between five and six (depending on the diameter) cut-outs for radical tuning. The sound the China crashes produce is equally individual, as elements of both types of cymbal mix. Trashiness is present in large measures, obviously, but also a shimmering brightness that allows them to penetrate with, in the case of the 19", savage results.